Green families facing the real tree vs. artificial tree conundrum may expand their holiday decor possibilities with an eco-friendly possibiliTree. Architect Richard Babcock designed this natural, mess and waste free alternative to real Christmas trees when he “tired of finding, hauling, displaying, watering and disposing of the bulky, needle-dropping, space-guzzling evergreen every Christmas…” We think the modern possibiliTree is the perfect solution for green families who want a tree, but may not be home to care for it throughout the entire season — or for families with young kids who need to childproof their holiday decor scheme. Each possibiliTree is handmade in Minnesota from a variety of natural wood species including: wild cherry, walnut, birch and reclaimed deadwood, when available. More than a Christmas tree, possibiliTrees may be enjoyed and displayed year round as pieces of art when unadorned, and creatively decorated for many festive occasions such as birthdays, Thanksgiving, etc. 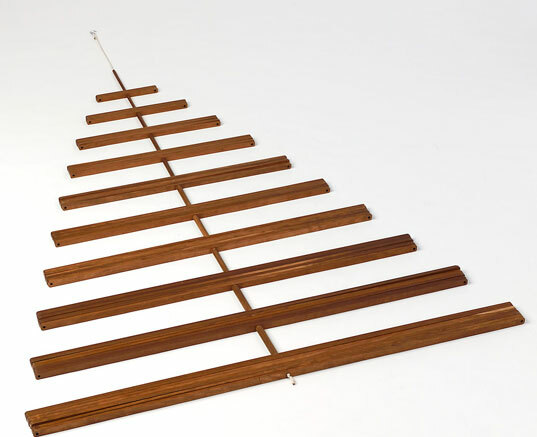 Each possibiliTree features slatted branches that fan out from a center rod which inserts into a matching wood base, and may be simply dismantled and stored after use — if not on exhibit year round. Available as a life-size 6 ft. tree that suspends from the ceiling with a thin wire, the largest of the possibiliTrees is a breathtaking showstopper which ‘magically’ hovers 18 inches over gifts placed beneath its 10 rows of wooden branches. It comes rolled in a bundle and pre-strung (requires no assembly). Also available in 2 ft. and 3 ft. tabletop versions, smaller possibiliTrees may be perched on a dining room table, placed in a foyer or perhaps as an extra special touch — displayed as a personal tree in your child’s bedroom during the exciting December countdown to Christmas. Even after the holiday hype has passed a possibiliTree lives on. Named for the open-ended ways to display each tree, possibiliTrees are full of decor possibilities. 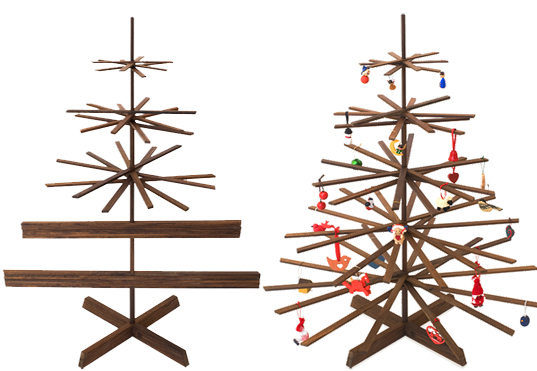 This modern alternative to the Christmas tree may end the real vs. artificial tree debate once and for all! Green families facing the real tree vs. artificial tree conundrum may expand their holiday decor possibilities with an eco-friendly possibiliTree. Architect Richard Babcock designed this natural, mess and waste free alternative to real Christmas trees when he "tired of finding, hauling, displaying, watering and disposing of the bulky, needle-dropping, space-guzzling evergreen every Christmas..." We think the modern possibiliTree is the perfect solution for green families who want a tree, but may not be home to care for it throughout the entire season -- or for families with young kids who need to childproof their holiday decor scheme.